Abstract: In Europe, 350.000 new sexual transmitted infections (STI) caused by Chlamydia types have been registered in 2009 . Approximately 70 % of infections with Chlamydia trachomatis run an asymptomatic course and therefore remain undetected. This can result in severe complications such as chronic diseases, infertility, complications in pregnancy and cancer [2, 3]. Current detection systems commercially available are based on serological methods. However, existing detection strategies have a number of disadvantages including the high market price, delayed diagnostics in the course of infection, false-negative results. Therefore a new, innovative detection system for home-care devices is a rising demand. We present a microfluidic test system which connects two methods with each other. It combines a high specific isothermal nucleic acid amplification technology with a detection on a simple lateral flow strip. The microfluidic chip is completed with a non-instrumented mirco-heating solution by using chemical exothermal reactions. As a whole, this nucleic quick test cartridge for Chlamydia trachomatis screening is a promising tool in home-care diagnosis. Summary: The main problem of early diagnosis of STI is the lack of suitable systems. Therefore a quick home test is needed. 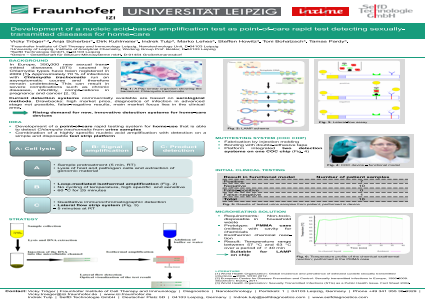 In this poster, a microfluidic cartridge combining an isothermal amplification with detection on a lateral flow strip is presented. References:  World Health Organization: Global incidence and prevalence of selected curable sexually transmitted infections – 2009. WHO 2012. European Centre for Disease Prevention and Control: Sexually transmitted infections in Europe, 1990-2009. Stockholm: ECDC, 2011. World Health Organization: Sexually Transmitted Infections (STIs) as a Public Health Issue, Fact Sheet 2004.